Decrease Wait-Times, Abandoned Calls & Costumer Frustration. If 63% of costumersprefer a call back as opposed to be sitting on hold for extended periods of time, what are you wainting for? CallBack gives callers the option to press "1" and recieve a call back from the next available agent. CallBack gives the customer the option of choosing between keep on waiting on line until an agent is available , or press “1” to be called back when one of the agents from your call center is available. By putting their information down and holding their “place” in line without requiring the customer to stay on the phone until a representative is available , with Callback Solution, the customer can simply hang up the phone and wait to be called back, saving both money and time.  CallBack solution will even give the option of extending the waiting period if the customer is busy at the moment he/she is called back. This feature will ensure that every customer can be reached at a time that is most convenient for him/her. CallBack will smooth out spikes in call volume and will allow the representatives to be as efficient as possible. The CallBack gives the caller an option to stay in line, or get a call back with an estimated time as to when to expect that call. In other words, it reduces the possibility that the caller cannot be served. A callback solution that allows the customer to hang up and enter the “virtual queue” not only avoids the frustration of waiting on hold but will also improve the experience of the customer all around. A call back solution will allow the call center to more accurately determine the optimal staff size since it would allow distributing the call load evenly and throughout the day rather than having peak hours, every hour of the day can be used efficiently. A tool that is often used to for finding the right service level is a metric known as forecasting accuracy. The hiring and training of agents usually accounts for 70-80% of the call center budget, many different algorithms are used to determining the right number of agents required to meet the anticipated Call volumes. CallBack will allow the call center to more accurately determine the optimal staff size since it would allow distributing the call load evenly and throughout the day rather than having peak hours, every hour of the day can be used efficiently. CallBack will free up lines since the customer will not stay on hold thus reducing Telecommunications costs dramatically. This will also reduce price associated with Toll Free and trunking since less lines will be needed. You can distribute the work load evenly, distributing the call volume during spikes and dead hours thus reducing the number of agents allocated to a particular campaign. Monitor and take decisions with our comprehensive analytics system that shows you all the information about each campaign in Real Time. No investment on infrastructure, no installment of software or hardware necessary. Return on Investment can be seen in a very short period of time. Pay per Usage: Only pay for what you use. Go4clients allows you to create different callback solution campaigns each configurable and customizable according to your own needs, define how many agents will be available during different periods of time by day of the week, upload the audios you want the user to listen on each step of the callback solution flow, pause and start campaigns anytime and much more. Go4clients allows you to create different callback solution campaigns each configurable and customizable according to your own needs. What do I need to connect my call Center to Go4Clients’ CallBack? What types of systems are supported by Call Back? How long does it take to have an operational Callback solution? You need to configure Go4clients which will take a few minutes. You also need to configure your phone system to accept the calls from Go4Clients using SIP or PSTN and this depends on you. Does Go4Clients works with all Call Centers? What do I do if my call center does not support SIP? If your call center does not support SIP, we can transfer the call to the agents dialing a phone number.